There are 2 types of vacuum sealers for non-industrial uses: with a chamber and with external suction. Machines with a chamber, considered genuine professional vacuum sealers, package the product inside, in the “tank”. Machines with external suction, intended mostly for domestic use, leave the bag outside. 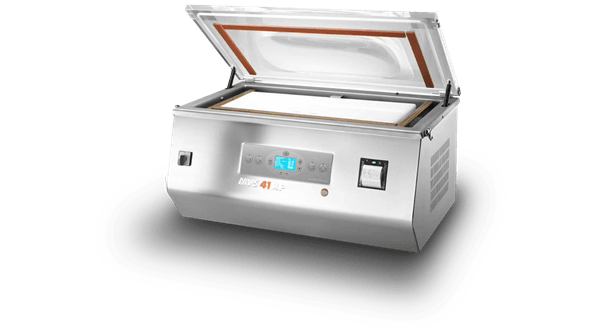 For this reason, chamber vacuum sealers are more suitable for the catering industry: their power is higher and therefore the degree of vacuum obtained is greater (about 99%), food preservation is better and lasts longer, and that’s not all. 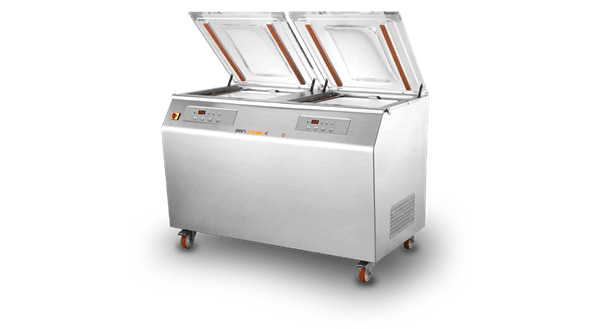 Trolley chamber vacuum sealers, designed for medium- to large-scale businesses or restaurants. 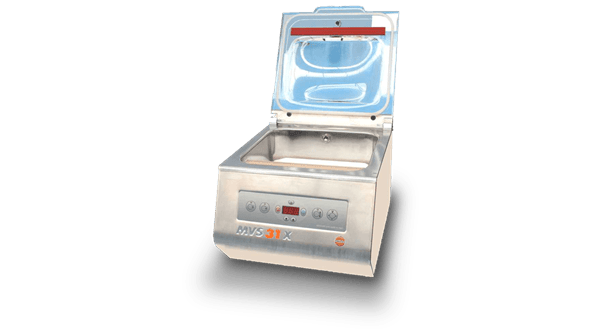 In addition to packaging food in a safer manner – both in terms of hygiene and appearance – chamber vacuum sealers can also be used for vacuum cooking. Sous-vide marinating and cooking techniques require the food to be marinated or cooked after being vacuum-packed. By preventing the product from oxidising and its organoleptic properties from being altered, the final food retains all of the flavour, consistency and freshness of when it was packaged. The same mechanism for creating the vacuum also allows liquid foods to be packaged, which cannot be done with a machine with external suction. In what ways do they differ? 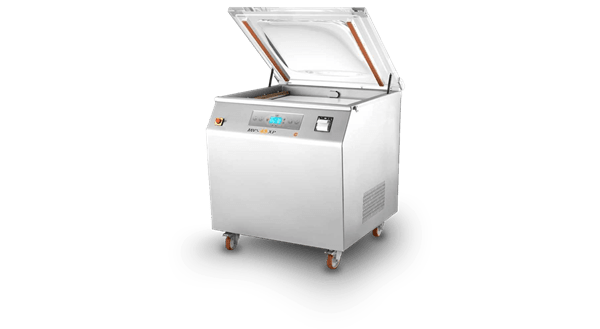 Tabletop chamber vacuum sealers are machines suitable for those small restaurants and delicatessens that need to place the packaging machine on the kitchen tabletop or shelves, within reach. The front sealing bars measure from 310 mm to 626 mm. 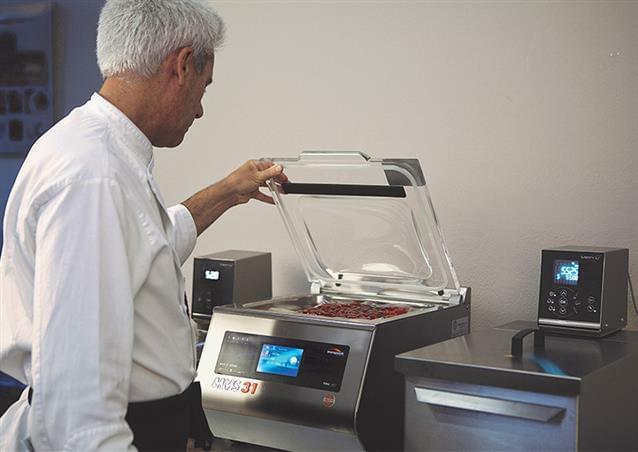 Even though they are professional vacuum sealers, their operation is easy to understand and accessible, starting with the display: an intuitive control panel on which you can set up to 10 customisable programs (for example, meat, fish, vegetables, liquids, etc.). For some models there is also a vacuum tracking and labelling system available; this means that the vacuum created during the process is monitored and the data collected is printed on special labels. 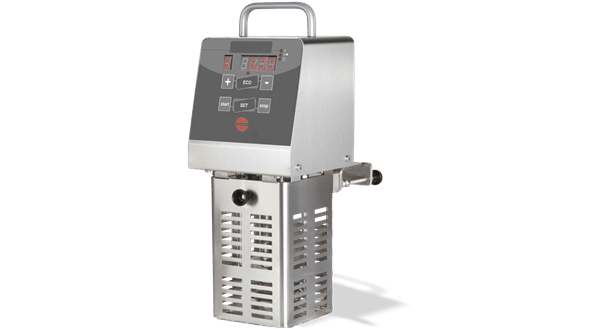 If you are accustomed to vacuum marinating and cooking, you will find the Mini Cook 15 very interesting, it is the only machine with a guide system for sous-vide cooking. 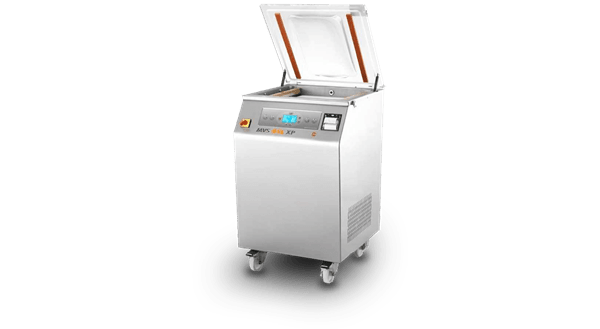 Trolley chamber vacuum sealers are, on the other hand, designed for those with larger spaces available or for those who need to move the packaging machine from one room to another: thanks to its pivoting wheels, it can be moved quickly and effortlessly. Trolley sealers are generally larger, considering that the smallest front sealing bar measures 450 mm and the largest one measures 656 mm. Some models have a double tank, i.e. divided into two separate chambers, a feature that allows two products to be packaged at the same time, even if two different programs are set. Here again you will find packaging machines designed to track vacuum during the process and print the information labels. Do you want to learn about all of the chamber vacuum sealers in the minipack®-torre range? Visit the specific section: you will find precise information on every model.